Experience the beauty and uplifting attributes of dance, its rhythms, power of community and also explore some of the challenges of humanity in 2018 at the annual Webster University Dance Ensemble. Performances take place April 27-29. The Webster University Leigh Gerdine College of Fine Arts Department of Dance presents the Webster University Dance Ensemble 2018 (WUDE), under the artistic direction of Beckah Reed, April 27-29. This year’s concert shares contemporary choreography from international artist Cleo Parker Robinson, alumna Eve Mason and faculty emeritus Gary Hubler. Webster's fine faculty, including Alicia Graf Mack, Michael Uthoff and Beth Steinbrenner, round out the diverse program with flamenco, contemporary and ballet. Come experience the beauty and uplifting attributes of dance, its rhythms, power of community and also explore some of the challenges of humanity in 2018. When: Friday and Saturday, April 27 and 28, at 7:30 p.m.; and Sunday, April 29, 2 p.m.
“We perform to transform ourselves and others-giving a voice to the voiceless,” says Cleo Parker Robinson, founder of Cleo Parker Robinson Dance. Cleo Parker Robinson Dance leverages the universal language of dance to honor African American Heritage, to explore the human condition, and offer a transformative experience through physical movement. “Yemanja (World Premier 2008) honors Yemanja, the Yoruba goddess of the sea. This work was created (by Cleo Parker Robinson) in celebration of the iconic Katherine Dunham’s never ending passion for life, in all its facets and complexities, its sensuality, spontaneity, and spiritual synchronicity.” Robinson says. We are proud to have Eve Mason as the first Lara Elizabeth Turek Alumna Fellowship Award recipient for Webster University Dance Ensemble. Eve Mason is originally from St. Louis, Missouri, where she graduated from Webster University with her BFA in Dance and Choreography, as well as her MA in Business and Leadership. After graduating from college, Eve moved to Los Angeles where she continues to pursue a dance and choreography career. “In this current political climate, labels are being used to divide rather than unify. At the beginning of this piece, we explore the fear and uncertainty that labels can evoke. Fear turns to hope when others see the similarities rather than the differences in each other. My hope, as the choreographer, is that this piece promotes self-reflection and thoughtful conversation”, states Eve Mason. This is a year where Webster University Dance Ensemble presents an International dance form, so Beth Steinbrenner, another alumna of Webster University, is teaching Flamenco to the students. She has been the director of Los Flamencos since 1999, studying and performing in Spain and the United States. We are fortunate to have her set Solea, a traditional Flamenco form (singing/dancing/guitar) from the Southern Andalucian region of Spain, on the students. It is often considered the "Mother of Flamenco". Solea is a heartfelt, often solemn and serious, song with poetic lyrics. Solea developed with influences from the Spanish Romani, Jewish, and Moorish cultures in Southern Spain. 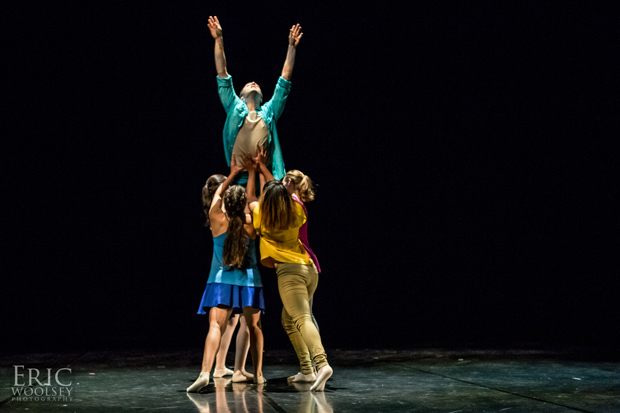 Faculty emeritus Gary Hubler has recreated Common Quest for the students of Webster University Dance Ensemble. “It is a strong quartet of women on pointe, ritualistic and powerful in its intent,” Hubler said. “It is always a pleasure to have Gary work with the students, as he is very professional, with a strong vision and expectation of quality,” said Beckah Reed, artistic director of WUDE. Gary Hubler joined the faculty of Webster University in 1973. From 1978 through 2006 he was the director of the Dance Program as well as Artistic director of Webster Dance Theatre and Webster University Dance Ensemble. A native of Saint Louis, his early training with Michael Simms and Stanley Herbert led to a five year association with the Municipal Opera of St. Louis (Muny). As part of that association he was able to serve as dancer choreographic assistant, and assistant stage manager. His additional training well known teachers, among them Leon Daniellan, Edna McRae, Matt Mattox, and Luigi. After years of performing in New York, Chicago, Los Angeles, and Las Vegas. Hubler returned to Saint Louis to pursue a career as a teacher and choreographer. Since retiring in 2006 he has continued to work as a master teacher and choreographer within the Saint Louis dance community. He is very pleased to continue to share his choreography with the students of Webster. A return to home base is always a joy. Eve Mason is originally from St. Louis, Missouri, where she graduated from Webster University with her BFA in Dance and Choreography as well as her MA in Business and Leadership. After graduating from college, Eve moved to Los Angeles where she continues to pursue a dance and choreography career. Her credits include: America’s Got Talent, Latin American Music Awards, American Billboard Awards, American Music Awards, Mexican Billboard Awards, America’s Got Talent (Seasons 5 & 6), Princess Cruises, Jennifer Lopez, Cee-Lo Green, Sheila E, Nike, MTV MADE Coach plus many more live shows and commercials. Eve is currently working as an assistant choreographer with Liz Imperio on projects while also owning and operating Velocity Dance Convention. Cleo Parker Robinson is founder, artistic director and choreographer of the 40+ year-old Cleo Parker Robinson Dance based in Denver, Colorado. She leads a professional dance Ensemble, Youth Ensemble, a School of Dance, an International Summer Dance Institute, a 300 seat theatre in her name, and a variety of community outreach programs. She has taught and performed with her Ensemble throughout Europe, and the African continent. Ms. Parker Robinson’s awards include the Colorado’s Governor’s Award for Excellence (1974), Denver’s Mayor’s Award (1979), induction into the Colorado Women’s Hall of Fame (1989) and the Blacks in Colorado Hall of Fame (1994). In 1998, President Clinton named Ms. Parker Robinson as one of two artists to be appointed to the National Council on the Arts where she served until 2005, also receiving a Kennedy Center Medal of Honor. She holds an Honorary Doctorate from Denver University (1991), an Honorary Doctorate of Humane Letters from Colorado College (2003), and an Honorary Doctorate of Public Service from Regis University in Denver (2008). Beth Steinbrenner has studied Flamenco both in the U.S. and in Spain. She has been featured on several television programs; including "State of the Arts", "Best of STL", and "Living St. Louis". Beth Steinbrenner has been Dance Director of Los Flamencos since 1999. She has taught Flamenco at All That Dance, St. Louis Community College and Washington University. She currently teaches at Just Dancing, Leaping Lizards Performing Arts, and Webster University. She is also a graduate of Webster University. Born in Chile to the founders of the Chilean National Ballet, Ernst Uthoff and Lola Botka, former members of the original Ballet Jooss, Michael Uthoff arrived in New York City to study dance at School of American Ballet, Martha Graham School of Contemporary Dance and The Juilliard School of Music. Soon after arriving he became a soloist with the Jose Limon Dance Company. He was an original member of the American Dance Company that opened the State Theatre at Lincoln Center performing leads in works by Jose Limon, Donald McKayle and Anna Sokolow. He then joined the Joffrey Ballet rising to principal dancer and afterward joined the First Chamber Dance Company of NY touring the USA, Latin America and Eastern Europe. Michael was part of the first faculty at SUNY Purchase and founded and developed the Hartford Ballet taking it to national prominence and setting up a guideline for companies around the country to follow. His tenure culminated with tours of China and Latin America. Michael Uthoff was artistic director of Ballet Arizona and the Ballet Estable del Teatro Colon in Buenos Aires, Argentina. In 2006 he accepted the post of artistic and executive director of Dance St. Louis continuing the presentation of quality dance performances while developing programs that enhanced the local dance community and thrilled the audiences. Spring to Dance and New Dance Horizons came to be while an intense Dance Education program was developed in the inner city. In 2017 he accepted the position of project director at Saint Louis Ballet overseeing new creations for the company. Michael has taught throughout the country in dance schools and at the University Level. He was a guest lecturer at UMSL’s dance department and in 2010 became a member of the Faculty at Webster University, a position he still holds. Uthoff has choreographed at every level and his works have been seen all over the world garnishing him several prizes. He has received many awards culminating with an Honorary Doctorate in Fine Arts from the University of Missouri in St. Louis.